Headaches – Simple Remedies – Dr. Nishal R.
Headaches are one of the most common complaints and symptoms. 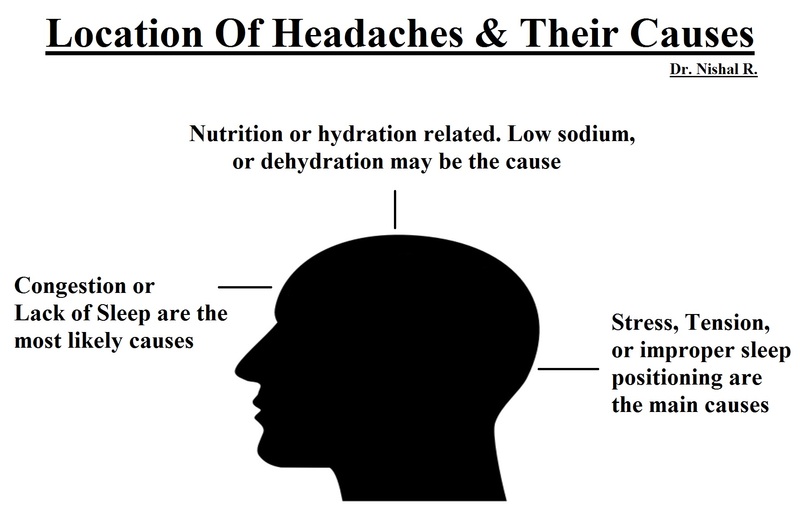 Almost all infections, nutritional deficiencies and neurological conditions involve headaches in their symptomology. – If the cause is dehydration, then the consumption of water with a little salt and sugar may help. Coconut water is the better solution. Most electrolyte rich drinks will help in this case. – Low sodium is corrected by simply eating a salted meal and avoiding too much fluids and excessive potassium. – In the case of a High blood pressure headache, an easy solution for this is to keep your legs knee deep in a bucket of hot water. Sit there for about 25 minutes. This helps to reduce intracranial pressure, thus relieving pain. – Low blood sugar is corrected by eating a carbohydrate rich meal and avoiding lemon, cinnamon, bitter foods and vinegar. – In the case of eye strain, it is best to sleep or take a nap. If you are a person that constantly works infront of a computer screen, it is advised to use Ghee as eye drops. Simply putting 2 drops of ghee into your eyes at night, just before bed will help relieve eye strain. – Improper Sleeping Positions usually involve pillow height. Sometimes, sleeping with too many pillows under your head can cause a headache from the upper neck muscles. Try sleeping with less pillows. – Stress and tension can be resolved through massage, preferrably deep tissue massage. Acupressure on the back of the neck is extremely beneficial and can give immediate results. If stress cannot be avoided, try using adaptogenic herbs like Ashwagandha, Tinospora Cordifolia, or Holy Basil (with medical supervision). – Vitamins and Minerals: B-vitamin deficiencies can cause headaches and can be corrected with the consumption of chicken, liver, salmon, brewers yeast etc. An Iron deficiency can cause a reduction in hemoglobin which prevents proper oxygenation and causes a variety of symptoms including headaches. Supplement iron with red meat, liver, and green leafy vegetables. – Alcohol related hangovers can be treated effectively by taking a teaspoon or two of apple cider vinegar in a glass of water. Hangovers can be prevented with the use of Thiamine. – In the case of allergies, the popular east Indian drink known as “golden milk” or “turmeric milk” is the most effective remedy. If you don’t have access to fresh raw milk, you can use almond milk instead. Turmeric is a powerful anti-histamine, anti-inflammatory and analgesic. It will reduce both the allergies and the headache. A natural alternative for Asprin is White Willow Bark. This herb has been used for all kinds of pain including headaches/migraines. The key ingredient in White Willow Bark is “Salicin” which functions a lot like Aspirin. Just like Aspirin, White Willow Bark must be used with caution as it slow down blood clotting.